Small and fleshy. Rigid and flat. These are the characteristics of a plantar wart and they are seen on the bottoms of your feet. Plantar warts are brown or gray lumps that are seen on the soles of your feet. They are benign skin growths that stem from the HPV or human papillomavirus. This virus can enter your skin through tiny cuts. They are commonly noted beneath the pressure points on the heels or balls of the soles of your feet. They are no cause for worry, but they can cause discomfort at times. This particular type of virus is not as contagious as other warts, but can still be spread to others. It can exhibit itself in moist and warm areas, such as the shower floor and any public area where others are walking barefoot. Some people are more prone to contracting plantar warts than others are, as each person responds differently. Children, teenagers, people with compromised immune systems and skin conditions that cause one to have cuts in their skin are most commonly affected. Treatment of plantar warts is not an easy task. If someone has plantar warts they should see their podiatrist for removal of these skin growths. Self-treatment is not advisable as there is the possibility of other skin growths to be mistaken for plantar warts. A podiatrist will be able to tell just by looking at someone’s feet whether the skin growth is a plantar wart. A plantar wart sometimes has the same appearance as a callus or a corn and the podiatrist may have to investigate further with the use of a scalpel. Plantar warts will bleed whereas a corn or a callus will not. There is the chance that attempts to remove the plantar wart will cause a new wart to grow. Not treating them, however, will cause them to grow in to clusters or groups. 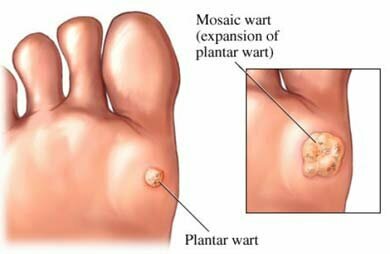 Plantar warts can also become quite painful. You can opt to not treat a plantar wart and it may go away, but many do not like to wait for this to happen. Some treatments for plantar warts can include the use of duct tape, salicylic acid, cantharidin, cryotherapy, surgery and medications. The best means of avoiding plantar warts are by good hygiene of your feet, wearing shoes in public places, avoiding any contact with a plantar wart and keeping your hands of your warts and not poking at them. If you suspect that you have a plantar wart seek the advice of a podiatrist for removal. He or she will most likely be able to remove the offending growth without any difficulty. Follow up visits may be necessary to be sure that the plantar wart goes away completely.